January 17th 1929; Popeye the Sailor Man, a cartoon character created by Elzie Segar, first appears in the Thimble Theatre comic strip. Popeye the Sailor Man is a fictional hero notable for appearing in comic strips and animated films as well as numerous television shows. He was created by Elzie Crisler Segar, and first appeared in the daily King Features comic strip Thimble Theatre on January 17, 1929. Popeye has now become the strip's title as well. Although Segar's Thimble Theatre strip, first published on December 19, 1919, was in its tenth year when Popeye made his debut, the sailor quickly became the main focus of the strip and Thimble Theatre became one of King Features' most popular properties during the 1930s. Thimble Theatre was carried on after Segar's death in 1938 by several writers and artists, most notably Segar's assistant Bud Sagendorf. The strip, now titled Popeye, continues to appear in first-run installments in its Sunday edition, written and drawn by Hy Eisman. The daily strips are reprints of old Sagendorf stories. In 1933, Max and Dave Fleischer's Fleischer Studios adapted the Thimble Theatre characters into a series of Popeye the Sailor theatrical cartoon shorts for Paramount Pictures. These cartoons proved to be among the most popular of the 1930s, and the Fleischers—and later Paramount's own Famous Studios—continued production through 1957. The cartoons are now owned by Turner Entertainment, a subsidiary of Time Warner, and distributed by sister company Warner Bros. Entertainment. Over the years, Popeye has also appeared in comic books, television cartoons, arcade and video games, hundreds of advertisements and peripheral products, and a 1980 live-action film directed by Robert Altman starring comedian Robin Williams as Popeye. In most appearances (except during the World War II era), Popeye is a middle-aged sailor with a unique way of speaking, disproportionately muscular forearms with two anchor tattoos, thinning hair, and an ever-present corncob pipe (which he toots like a steamship's whistle at times). Popeye is generally depicted as having only one eye, his left. In at least one Fleischer cartoon, Bluto refers to Popeye as a "one-eyed runt." Mostly quiet as to how he lost his right eye, the sailor claims it was in "the mos' arful battle" of his life. Later versions of the character had both eyes, with one of them merely being squinty, or "squinky" as he put it. According to the official site, Popeye is 34 years old and was born in a typhoon off Santa Monica, California (however, in Popeye, the Ace of Space his original age is given as 40 by an alien aging machine). In addition to a gravelly voice and a casual attitude towards grammar, Popeye is known for having an apparent speech impediment (a common character-distinguishing device in early cartoons), which either comes naturally or is caused by the ever-present pipe in his mouth. Among other things, he has problems enunciating a trailing "t"; thus, "fist" becomes "fisk" (as sung in his theme song, which makes it conveniently rhyme with "risk") and "infant" becomes "infink." This speech impediment even found its way into some of the titles of the cartoons. Popeye is depicted as having superhuman strength, though the nature of his strength changes depending on which medium he is represented in. Originally, the comic-strip Popeye gained his strength and invulnerability in 1929 by rubbing the head of the rare Whiffle Hen. From early 1932 onward, especially the cartoons, Popeye was depicted as eating spinach to become stronger. The animated shorts depicted Popeye as ridiculously strong, but liable to be pummeled by the much larger Bluto before his eating of the spinach. When fed up with this treatment or exhausted, he would eat spinach, which would instantly restore and amplify his strength to an even greater level. In the comic strips, spinach is presented as a panacea, infusing Popeye not only with his extraordinary strength, but also making him invulnerable to all sorts of threats (including bullets, a basilisk's petrifying gaze, or aliens' weapons) and even capable of feats like flight or extraordinarily fast swimming (usually with the aid of his pipe as a propeller). In the animated shorts, Popeye's ingestion of spinach – which is almost invariably canned – is equally fanciful and often involves squeezing the can until the top opens, or sucking the spinach through his pipe, and on rare occasions, even ingesting the can as well. Occasionally, spinach has a similar invigorating power on other characters. Other differences in Popeye's story and characterization show up depending upon which medium he is presented in. While Swee'Pea is definitively the adopted child of Popeye in the comic strips, he is often depicted as being related to Olive Oyl in cartoons. The cartoons also occasionally feature family members of Popeye that have never appeared in the strip, notably his look-alike nephews Peepeye, Pupeye, Pipeye, and Poopeye. Even though there is no absolute sense of continuity in the stories, certain plot and presentation elements remain mostly constant, including purposeful contradictions in Popeye's capabilities. Though at times he seems bereft of manners or uneducated, Popeye is often depicted as capable of coming up with solutions to problems that (to the police, or, most importantly, the scientific community) seem insurmountable. Popeye has, alternatively, displayed Sherlock Holmes-like investigative prowess, determining for instance that his beloved Olive was abducted by estimating the depth of the villains' footprints in the sand, scientific ingenuity (as his construction, within a few hours, of a "spinach-drive" spaceship), or oversimplified (yet successful) diplomatic argumentation, by presenting to diplomatic conferences his own existence (and superhuman strength) as the only true guarantee of world peace. Popeye's vastly versatile exploits are deemed even more amusing by a few standard plot elements. One is the love triangle between Popeye, Olive and Bluto, and the latter's endless machinations to claim Olive at Popeye's expense. Another is his (near-saintly) perseverance to overcome any obstacle to please Olive – who, quite often, treats him like dirt, and ends up being the only character capable of beating him up. Finally, in terms of the endless array of villain plots, Popeye mostly comes to the truth by "accidentally" sneaking on the villains, the moment they are bragging about their schemes' ingenuity, thus revealing everything to an enraged Popeye, who uses his "fisks" in the name of justice. Thimble Theatre's first main characters/actors were the thin Olive Oyl and her boyfriend, Harold Hamgravy. After the strip moved away from its initial focus, it settled into a comedy-adventure style featuring Olive, Ham Gravy, and Olive's enterprising brother, Castor Oyl. Olive's parents, Cole and Nana Oyl, also made frequent appearances. Popeye first appeared in the strip on January 17, 1929 as a minor character. He was initially hired by Castor Oyl and Ham to crew a ship for a voyage to Dice Island, the location of a casino owned by the crooked gambler Fadewell. Castor intended to break the bank at the casino using the unbeatable good luck conferred by stroking the hairs on the head of Bernice the Whiffle Hen. Weeks later, on the trip back, Popeye was shot many times by Jack Snork, a stooge of Fadewell's but survived by rubbing Bernice's head. After the adventure, Popeye left the strip—but due to reader reaction he was quickly brought back. The Popeye character became so popular that he was given a larger role, and the strip was expanded into many more newspapers as a result. Though initial strips presented Olive Oyl as being less than impressed with Popeye, she eventually left Ham Gravy to become Popeye's girlfriend-and Ham Gravy left the strip as a regular. Over the years, however, she has often displayed a fickle attitude towards the sailor. Castor Oyl continued to come up with get-rich-quick schemes and enlisted Popeye in his misadventures. Eventually he settled down as a detective and later on bought a ranch out West. Castor has seldom appeared in recent years. In 1933, Popeye received a foundling baby in the mail, whom he adopted and named "Swee'Pea." Other regular characters in the strip were J. Wellington Wimpy, a hamburger-loving moocher who would "gladly pay you Tuesday for a hamburger today" (he was also soft-spoken and cowardly, which may have led to the coinage of the word wimpy); George W. Geezil, a local cobbler who spoke in a heavily affected accent and habitually attempted to murder or wish death upon Wimpy; and Eugene the Jeep, a yellow, vaguely dog-like animal from Africa with magical powers. In addition, the strip featured the Sea Hag, a terrible pirate, as well as the last witch on earth (her even more terrible sister excepted); Alice the Goon, a monstrous creature who entered the strip as the Sea Hag's henchman and continued as Swee'Pea's babysitter; and Toar, a caveman. Segar's strip was quite different from the cartoons that followed. The stories were more complex, with many characters who never appeared in the cartoons (King Blozo, for example). Spinach usage was rare and Bluto made only one appearance. Segar would sign some of his early Popeye comic strips with a cigar, due to his last name being a homophone of "cigar" (pronounced SEE-gar). 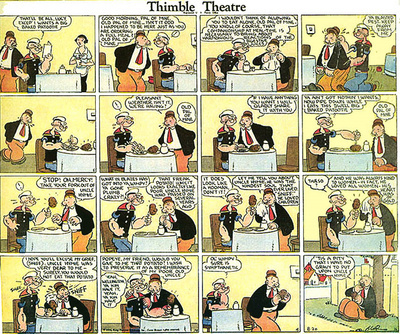 Thimble Theatre soon became one of King Features' most popular strips during the 1930s and, following an eventual name change to Popeye in the 1970s, remains one of the longest running strips in syndication today. 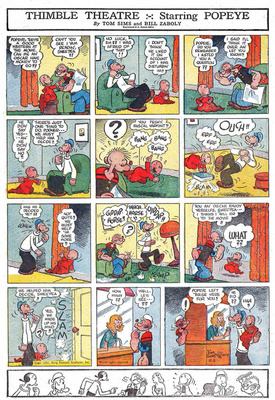 The strip carried on after Segar's death in 1938, at which point he was replaced by a series of artists. In the 1950s, a spinoff strip was established, called Popeye the Sailorman. Acknowledging Popeye's growing popularity, the Thimble Theatre strip was re-named Thimble Theatre Starring Popeye during the 1960s and 1970s, and was eventually retitled, simply, Popeye, the name under which the strip continues to run.